“The Legend of the Secret Flowers” from Christian Faith Publishing author Brandi Chambless is a tale that comes from a mother’s attempt to explain how flower bulbs become flowers. The useful analogy quickly became a powerful tool for explaining Biblical concepts. 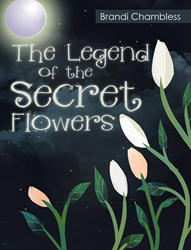 “The Legend of the Secret Flowers”: a teaching tool that reinforces simple Scriptural precepts. “The Legend of the Secret Flowers” is the creation of published author, Brandi Chambless. Brandi is a native of Avoyelles Parish, Louisiana. Brandi has participated in the arts at both sacred and secular venues, including the Monroe Little Theatre as well as numerous churches throughout the Southeast. She has led worship and volunteered in choral ministries for over thirty years. She has learned to be content no matter what “state” she is in. Brandi has one biological son, Elijah, who is her little Georgia peach. She has been a foster mom and enjoys opening her home to others. Her most famous dish, “Don’t Tell Mama Red Beans and Rice,” is something she shares with almost everyone who is part of her heart. Published by Christian Faith Publishing, Brandi Chambless’s new book begins with just an ordinary day when Mama decided the time was right to plant her bulbs in the garden. Just like every other day, Mama enlisted the help of her four-year-old son to become her “special helper,” as she called him. By virtue of the hidden nature of freshly planted bulbs, Mama’s special helper could not grasp why he could not see the flowers, even after all he buried the bulbs. It was then that Mama created the mystique of the secret flowers and told the boy how they were becoming something new in God’s rich soil. The legend of the secret flowers eventually became a teaching tool that reinforced several simple scriptural precepts, including the notion that God is always working on people. The boy grew bigger, but he never forgot the legend nor the lessons of the secret flowers. Deep in her heart, Mama also hid away what God had given to her. She always remembers those secret flowers and that day with her four-year-old boy, especially in spring when the flowers are in bloom. Viewers may get an inside look at “The Legend of the Secret Flowers” on the Christian Faith Publishing YouTube channel. Consumers can purchase “The Legend of the Secret Flowers” at traditional brick & mortar bookstores, or online at Amazon.com, Apple iTunes store, or Barnes and Noble. For additional information or inquiries about “The Legend of the Secret Flowers,” contact the Christian Faith Publishing media department at 866-554-0919. To request Brandi at your church or school for a book event, email uglyflowerrocks(at)gmail(dot)com. Workshops include book readings, writing competitions, and How A Book Becomes A Book. Follow @TheSoapboxBrandi to keep up with new follow up releases coming up this year.